We offer a wide range of Hydraulic and Pneumatic Fitting. 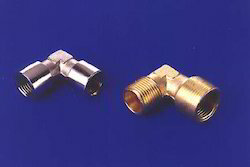 These fittings have varied applications in various industries. Our hydraulic and pneumatic fittings are made from best quality raw materials. Offering a wide range of Hydraulic and Pneumatic Fitting to our valuable client. These are made from high quality raw material. These are provided in different specification to meet the diverse requirement of client. Our quality controllers start quality checking process, from the first stage of procuring products till its final dispatch.